June birthdays have a lovely gem for their birth month representation. 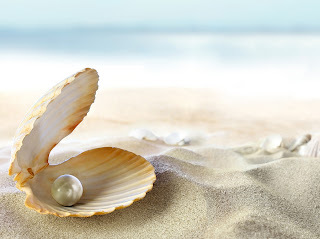 The amazing Pearl is the birthstone for the month of June. The official color is the white pearl but most June babies feel that any color of pearl is acceptable as their birthstone. June has 2 alternative birthstones that are recognized as well; the Moonstone and the Alexandrite. The Pearl is an unusual gemstone in that its creation is not typical of our mineral gems we see normally. The pearl comes from the sea creature known as the mollusk. When an irritant lands in the flesh of a clam, oyster or mussel, a protective substance called nacre is produced. Over several years of time, this nacre completely covers the irritant in many layers of nacre which forms the beautiful pearls we see today. The Natural Pearl is still a rarity. 90% of the pearls you see out in the jewelry marketplace are cultured pearls. Cultured pearls are when man places an irritant into the shell to stimulate the product of nacre. Once the pearls are matured and harvested, they can be used in jewelry. Pearls come in a large variety of shapes, sizes and colors. The most popular to buy are the white ones, but there are many rages of colors available. The rarest color is the Black. It also depends on where your Pearl is harvested around the world. There are several locations pearls are harvested and they are named for the ares, such as the Tahitian Pearl, The South Seas Pearl, The Akoya Pearls and the Freshwater Pearls. Interestingly, Pearls are also ground up and used in some beauty/cosmetic products for shimmer and shine. Pearls are a worldwide recognized gemstone that is very popular. Many cultures have a large reverence for pearls and to find matching sizes, colors and shapes and have a necklace or other pieces of jewelry made from that can become very expensive. Pearls are considered a classic piece of jewelry and will never go out of style. People born in June have a lovely birthstone they can enjoy for a lifetime.